This dinner will be hosted by Carol and Walter Beebe at their West Village home on Tuesday, April 25, 2018 at 7:30 pm. 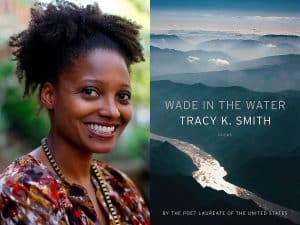 Tracy K. Smith will discuss her body of work and her latest book, Wade in the Water, a new collection of poetry. Tracy K. Smith is is an American poet and educator. She has published three collections of poetry, winning the Pulitzer Prize for her 2011 volume Life on Mars. She is currently the United States Poet Laureate. Seating at this dinner will be limited and available by making a donation to PEN America. The PEN America Authors’ Evenings are nights of literary dinners in private homes and intimate settings in New York City. Please visit the Authors’ Evenings webpage for our full calendar of dinners. Proceeds from the PEN America Authors’ Evenings dinners support PEN America’s programming to secure the liberty of persecuted and imprisoned writers around the world, to defend freedom of expression, and to promote literature and international cultural exchange. Please contact Florencia Varela at [email protected] for more information.